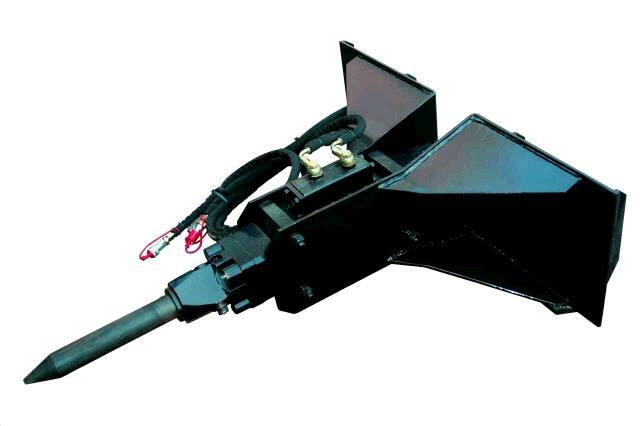 Large Hydraulic pavement breaker for skid-steer loaders. Hits at 750 ft lbs. Produces 600 to 1,200 blows per minute. Fits any skid steer machine using the universal "Quik-Tach" mounting system and "Flat-Face" hydraulic couplings. Requires between 8.0 and 18.0 gpm hydraulic flow. * Please call us with any questions about our hydraulic breaker 750lb class rentals in Oak Grove MO, Blue Springs MO, Independence MO, Lexington MO, Odessa MO, Independence MO and Western Missouri.